Popcorn balls are a favorite childhood food for many people. Luckily, they're also easy to make at home. We've collected some great popcorn ball recipes that will help you replicate your childhood memories in your own kitchen. Popcorn ball recipes encompass a large amount of different flavors, textures, and tastes. The variations you can add to them are almost infinite, ranging from a simple caramel sauce to popcorn ball recipes calling for molten chocolate centers with cashews, marshmallows and other treats on the outside. When you make popcorn balls there are two main things to take into account. The first is the flavor you want the popcorn balls to have and the second is the type of binding you will use. You can find just about any flavor of popcorn ball recipe. Some typical flavors are caramel, vanilla, chocolate, peanut butter, and marshmallow. You can add the flavorings in several ways. Some are mixed into the binding like vanilla, peanut butter, melted chocolate or marshmallow, and many spices. 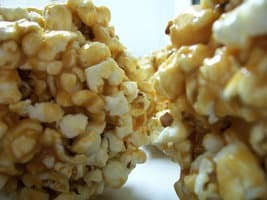 Some are added as a garnish to the finished popcorn balls such as nuts, whole marshmallows, or a chocolate drizzle. And some are inserted directly into the center of the popcorn ball to create a center of flavor, chocolate or peanut butter are two common centers. The binding used in popcorn ball recipes is more limited than the amount of flavorings but it still has some variety. The binding is what actually holds the popcorn ball together. Some common bindings are hard caramels, gelatin, marshmallow, hard sugar, and chocolate. We've tried to assemble a nice collection of popcorn ball recipes that will let you make many different types. We hope you enjoy making these popcorn balls as much as we do! This popcorn ball recipe is a great, old fashioned, way to make them. They have a great vanilla-caramel flavor and can be made to various levels of hardness, depending on your preferences.